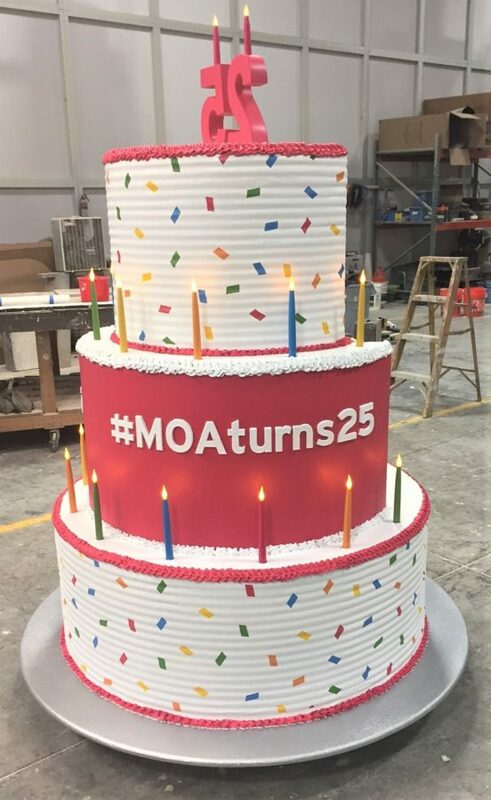 An agency contacted us when they were looking for a way to help the Mall of America celebrate its 25th birthday. What better way to do so than to build a giant cake that can be used as a photo op? The cake needed to be sturdy, able to withstand travel and the wear and tear of people climbing on it. The cake was sculpted from foam and a secret formula was used for the frosting and decorations. It was on casters for easy movement and was branded with the MOA logo and a hashtag for social media visibility. Working off the design given to us, we used a urethane hard coat to ensure the cake was durable, yet could be moved easily as it traveled from location to location. The result was a fun photo op for people to snap pictures with and celebrate the iconic Mall of America.